Whenever a city wins a bid for a major international sporting event, there is a surge in construction activity—some to complete projects previously approved (e.g. infrastructure improvements) and some to construct new venues specific to the needs of the games. Either way, there is inevitably a crunch on resources and a scramble to meet fixed deadlines. Such was the case when the City of Toronto was selected to host the 2015 Pan Am & Parapan Am Games in 2009. There is also typically a debate about the future need for the facilities constructed and the value of the investment. Planning of any new venues therefore requires foresight and quality construction to ensure long-term sustainability of the facilities. Among the numerous new construction sites was the BMX Supercross Track Legacy Project in Etobicoke’s Centennial Park. The project faced both challenges—incredibly short construction timelines, as well as ensuring the finished product would be in demand for future events beyond the Pan Am Games. Trax as the successful proponent to design this venue. Other partners in the construction of this venue include Halsall Associates (structural design), EMC Group Ltd. (subgrade services and water management), and Smith + Andersen (electrical). This author is a project manager with Gateman-Milloy, a firm with BMX track building experience that was awarded the construction work on the facility in August 2014. A firm completion date of May 2015 was established in order for the City of Toronto to host the June 2015 Canada Cup BMX Olympic Qualifying Series—an important event in its own right, but also serving as a test before the Pan Am Games. This meant there was no time to waste. BMX Supercross racing became an Olympic medal sport for the 2008 Beijing summer games under the IOC-recognized Union Cycliste Internationale (UCI). It is a type of off-road bicycle racing derived from motocross racing. Races are held on purpose-built, off-road, single-lap tracks that usually consist of a starting gate, a groomed serpentine dirt race course made with jumps of various sizes, large banked corners for riders to maintain speed, rollers, and a finish line. Toronto’s BMX Supercross Track Legacy Project was constructed for the Pan Am Games, but was meant to endure far longer—it is already building its reputation as the premier professional BMX course in the world. The closed-loop track covering 2.55 ha (6.3 acres) of Centennial Park in Etobicoke is among a handful of tracks in Canada to be designed and constructed to UCI standards. The venue features 517 m (1696 ft) of track, four straightaways, and a trio of sharply banked turns. An iconic cast-in-place (CIP) concrete ramp structure finished with steel pipe screens and lit canopies dominates the park’s skyline. All walls were constructed of board-form finished concrete. The structure comprises an 8-m (26-ft) high suspended slab ramp and 5-m (16-ft) high ramp, for elite and amateur riders respectively. Both feature state-of-the-art pneumatically operated starting gates. Below the elite ramp is lit indoor and outdoor storage for the entire park. The indoor storage is finished with glazed masonry block. The track is constructed of selected earth, capped with limestone screenings and polymer-based soil stabilizer. This project was extremely challenging, requiring significant site servicing work, precise and complex earthwork for the track course, and similarly precise forming of the reinforced concrete start ramps and fabrication of the start gate screening. The challenge was heightened by the requirement to carry out this work throughout the winter of 2014/15 for a spring completion to achieve UCI certification and test events in advance of the Pan Am Games. This planning of this unconventional project was addressed through an unconventional process. The design team considered various materials and researched the recent history of these facilities throughout the world and in Olympic contests. The esthetics of concrete allowed the practical considerations of storage, ramp heights, and retaining wall sections to each be expressed as architectural elements within a single form. Board-formed concrete, prefinished concrete masonry units (CMUs), and smooth-faced framing members all add to the distinct language of each element—at once separate and unified. The solidity of the concrete base structure is offset by the lightness of the superstructure constructed entirely of hot-dip galvanized piping that form the guards at landings and the overhead structure shading the start gates. The overhead structure also incorporates continuous linear light-emitting diodes (LEDs) within the piping. Gateman-Milloy employed several strategies to meet the completion date, including the negotiation of an overtime regime with the client and architectural concrete trade to accelerate the schedule during the seasonable fall weather. It also proposed a non-vibratory compaction methodology for backfilling the ramp retaining wall prior to concrete reaching 75 per cent strength, as well as utilizing a high-early-strength concrete mix design to accelerate the 75 per cent strength. With a severely compressed schedule, portions of the work had to be completed during the winter. To allow work to continue, winter protection measures were implemented from December through March. These included heating, tarping, and employing weather mixes for concrete curing. Other challenges encountered on the project included paving the three 180-degree track turns and placing asphalt on slopes of 1:1 or steeper. The 5-m (16-ft) wide elite ramp, on a 28-degree slope, had to be poured in December with a specific depth broom finish. Since the ramp was a suspended slab, there was no adjacent surface from which to stage—this meant the use of booms to complete the broom finish. Apart from the tight deadline, the biggest construction challenge facing the team was the location of the venue. The site of the track had been selected early on in the city’s planning process, even before the design team was engaged. As soon as design and construction planning began, the site was found to be a low point of the park; further, its drainage catchment area was enormous. 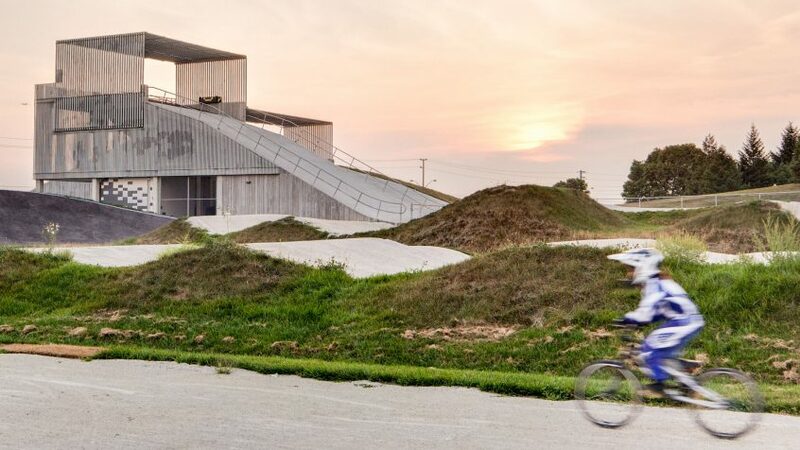 The BMX Supercross Track Legacy Project has been identified as one of the top five projects in the world for 2015 by ArchDaily in the International Sports Architecture category. Internationally, it was featured in Designlines, Dezeen, and Designboom magazines—the third publication declared it “an object in a landscape, and a landscape in its own right.” It served as the backdrop to the CBC national broadcast of Pan Am Day in Canada, hosted by Scott Russell. There were two primary challenges facing the construction of the Toronto project—timing and long-term use. The deadline was met in spite of the many challenges, and the facility has a bright future ahead, both because of its architectural esthetic and its use as a world-class sporting venue. Mike Dawson is the lead project manager of Gateman Milloy’s Site Development and Landscape Construction Division. A subject expert in landscape design and construction, he is at the forefront of applying new technologies and methodologies in his field. Dawson has more than 30 years of experience in estimating, project management, cost control, and site experience; he began as an assistant estimator and site administrator at the Expo’86 site in Vancouver in 1985. Dawson’s expertise includes work in major urban landscape, recreational landscape, and civil and environmental development projects. He can be reached via e-mail at mdawson@gatemanmilloy.com.